Alfred E. Edwards Jr, 93, of Manchester, husband to the late Barbara (Leavitt) Edwards, passed away peacefully Tuesday, June 19, 2018, in Manchester. Alfred was born in Natick, MA on August 17, 1924, son to Alfred E. Edwards Sr. and Blanche E. (Metcalf) Edwards. Mr. Edwards attended Natick public schools until his senior year when he transferred to Mercersburg Academy in Pennsylvania as a “working boy”. 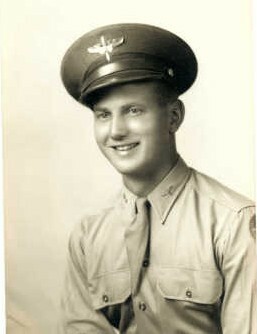 He entered the Massachusetts Institute of Technology on a competitive scholarship in 1942 and during his freshman year signed up to serve in the U.S. Army Air Corp. Mr. Edwards rose to the rank of First Lieutenant as a pilot of a B-17 bomber in the 379th bomb group of the 8th Air Force. He flew 31 missions over Europe and received the EAME Theatre Ribbon with 3 battle stars, the Air Medal with four Oak Leaf Clusters, and the Distinguished Unit Badge. After returning from military service, he completed M.I.T. in three years and went to work as a mechanical engineer for United Technologies. He worked on jet engine afterburners for Pratt & Whitney and later helped develop fuel cells for the Space Shuttle and Apollo Programs, thus allowing America to land the first men on the moon. Alfred is survived by his son Steven Edwards of Manchester and his daughter Nancy Edwards of Sagamore Beach, MA; his daughter-in-law Marcia Edwards of Manchester; his three grandchildren Elizabeth Edwards and her husband David Engel of Brooklyn Heights, NY, Rebecca Edwards of Farmington and Sierra Edwards of Manchester as well as numerous nieces and nephews. In addition to his wife and parents, Alfred was predeceased by his son William A. Edwards and his sister Priscilla Edwards Leavitt.